Caterpillar Local Host Plant: Acacia concinna (Fabaceae, Leguminosae, common name: soap pod). 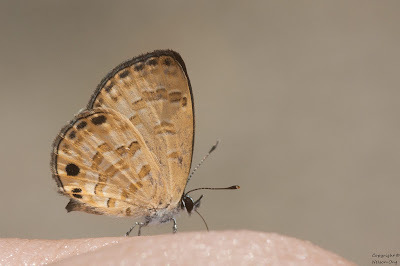 Upperside, both sexes are brown. 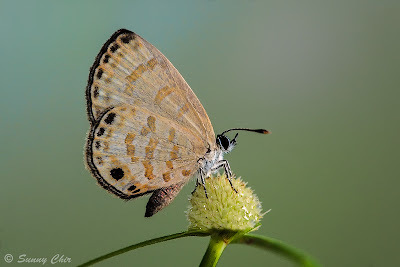 Underside, both sexes are pale yellowish orange and similarly marked in both wings with darker yellowish orange spots arranged the form of post-discal band, cell-end bar and subbasal markings. 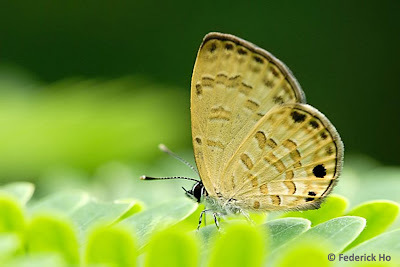 The forewing has a series of small black marginal spots and a series of faint dark yellowish orange submarginal spots. The hindwing has dark marginal spots in spaces 3-6, of which the one in space 6 is the largest. There are two tiny black tornal spots at the end of vein 1b, and a larger black subtornal spot in space 2. 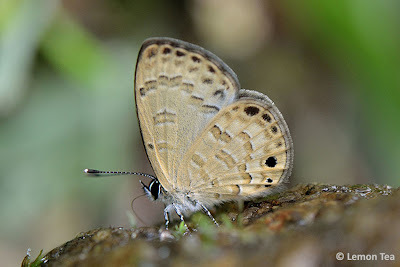 The hindwing of this species is tailless. 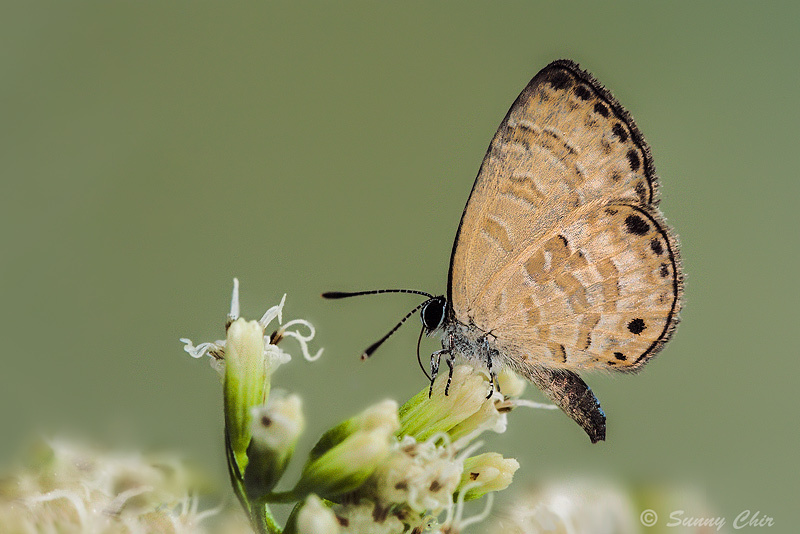 A Banded Lineblue visiting a flower of Mile-a-minute. This tiny species was recently discovered in Singapore (see this BC blog article for details). Sightings of adults have typically been in the vicinity of its local host plant, either visiting flowers on nearby flowering shrubs/herbs or puddling on wet ground. In flight, they can easily be mistaken as other similarly-sized Lineblues. A definite identification can only be made when the butterfly perches briefly and allows its trademark hindwing marginal spot in space 6 to be observed.